Can toilet paper have archival value? Upon receiving the corresponding box and opening the file, the curious researcher encounters an ordinary plain envelope, similarly labelled. Inside, as promised, rests a single, incredibly thin, translucent square of toilet tissue. 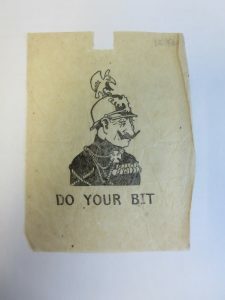 On it (also as promised) is printed the phrase “Do Your Bit” … and an evocatively detailed, if cartoonish, image of German Kaiser Wilhelm II. In an ideal world, we would have some solid facts about this odd little artifact. Instead, we have absolutely no information about its design, manufacture, sale, previous owner(s), or original donor, beyond the fact that someone, sometime, was under the impression that it dated back to 1914-1918, and donated it to the York-Sunbury Historical Society of New Brunswick. That society in turn donated some of its collections to the provincial archives. With so little contextual information, what can we possibly learn from a single sheet of toilet tissue? If we start with a few educated guesses, we can ascertain a surprising amount. First, both the text and the image on the square support its association with the Great War. Of course, it could be a souvenir production, of the kind sold at war museum gift shops, but the texture and slight discolouration of the paper suggest it is fairly old. So, we will take a leap of faith and assume it is from 1914-1918. What else can we discover? First, the text is written in English, suggesting it was produced in one of the English-speaking countries allied against the Central Powers. Second, the elaborate nature of the printed image would have been relatively expensive to produce – and therefore also to buy. Presumably, it was not meant for everyday use. Why, then, go to the trouble of printing it? It is entirely possible that it was produced and purchased as a mere novelty item. The original owner may have smirked at the implied insult of wiping his or her behind with an image of the Kaiser’s face, and thought no more about it. It is also possible that someone saw an opportunity to cash in on the combination of anti-German sentiment and toilet humour — possibly a war charity seeking funds. This does not seem altogether likely, however, since the respectable middle-class men and women who ran many of the major war charities would probably have considered it too crude. An enterprising businessperson, on the other hand, may not have shared such scruples, manufacturing and selling ‘Do Your Bit’ toilet paper to customers of all social classes who enjoyed its earthy humour. If the latter, it may have been sold purely for profit, or a percentage of the proceeds may have been donated to a war charity. There may be other explanations as well (feel free to suggest them in the comments section). From the distance of a century, the existence of this item says something more, too. 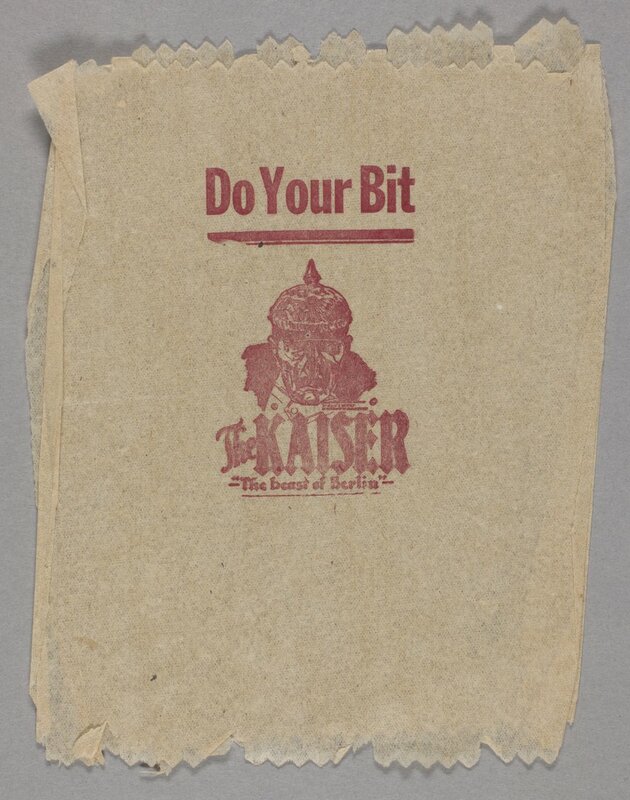 To start with, “Do Your Bit” toilet paper offers a peculiarly potent, if crude, means of embodying anti-German sentiment – an opportunity to put into personal action an idea more often expressed in words. The fact that someone saved a square is also significant. Ordinarily, toilet paper is inherently disposable, and of no interest in and of itself. (Pages of old Eaton’s department store catalogues served just as well – and with more interesting content – in thousands of Canadian outhouses in this era.) But this particular toilet tissue, with its implied insult, was saved, preserved for decades, and eventually donated to – and accepted by – historical and archival institutions. The image it bears, and the symbolic weight of the action for which it was intended, transform its significance completely. Can toilet paper have archival value? When it shows the ways in which anti-German sentiment found its way into the most intimate corners of English-speaking citizens’ lives during the First World War and took embodied form, it absolutely can. Dr. Sarah Glassford has a PhD in Canadian History from York University, and a MLIS from Western University. She is currently working as a digital archivist for the “Recounting Huronia” project based at Wilfrid Laurier University, and as an archivist for the Canadian Red Cross National Office. She is a co-editor of the “Canada’s First World War” series on www.activehistory.ca. My thanks to PANB photo archivist Joshua Green for this insight.